High-performance HDD Copier with transfer speeds of up to 9 GB per minute. Supports FAT16/32/64, NTFS, Linux(Ext2/Ext3/Ext4), Mac(HFS, HFS+, HFSX) file system copying. Data Sanitization: Quick Erase, DoD erase, and Secure Erase. Real-Time PC Monitoring with PC-Link software. iSecuLog Report Management records all task details for better production management. Cable–free connection for easier HDD insertion & removal. 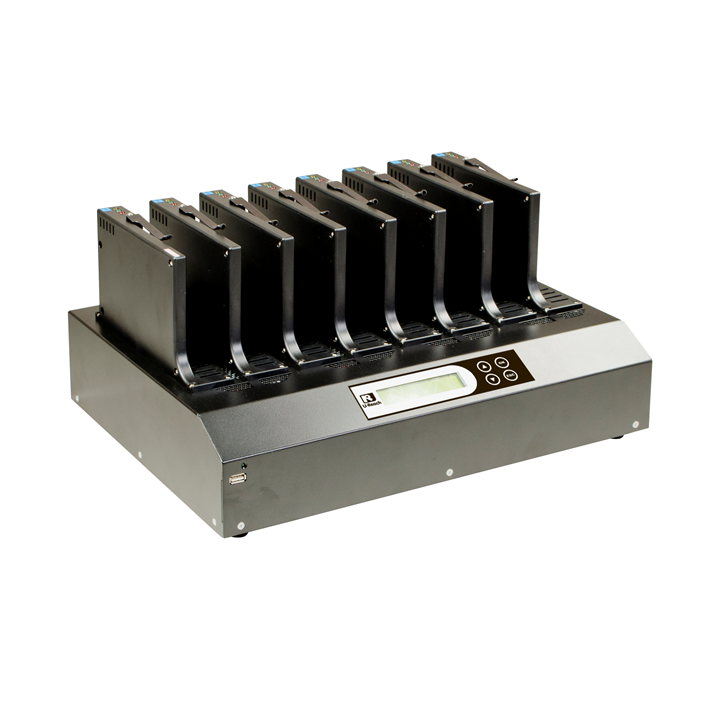 IT series is a professional SATA HDD duplicator, specially designed for high-volume duplication. U-Reach adopted a unique multitasking technology, it can simultaneously copy up to 7 HDD targets with a high transfer speed of 9GB per minute. We guarantee the highest productivity without speed degradation even as the number of targets increases. The IT series SATA HDD duplicator provides four copy modes: quick smart copy, all partitions copy, percentage copy and whole HDD copy that all meet different duplication task requirements. The quick copy mode copies data and skips blank area. NTFS, Linux (Ext2/Ext3/Ext4), FAT/FAT32, Mac (HFS, HFSX, HFS+) formats are all supported with quick copy mode. In addition, the IT series SATA HDD duplicator is equipped with different levels of secure erase functions, Quick Erase, Full Erase, DoD 5220 Erase government standards and Secure Erase which can fulfill different levels of security for HDD wiping. With up to 9 GB/m transferring bandwidth, the IT-G Professional Factory HDD Copier is the best solution for Professional HDD/PC/NB Manufacturers. Each SATA interface operates independently. No matter how many targets you would like to duplicate, the speed stays the same and doesn’t decline. 9 GB per minute is far beyond any PC-based duplicators. Whole HDD Copy mode supports all kinds of partition and data formats and copies every sector of the source HDD. This mode is compatible with the HDD formats of FAT16/32/64, NTFS, Linux(ext2/ext3/ext4), Mac(HFS, HFS+, HFSX). It will only copy the data and system area of the HDD which greatly reduces copying time. 4. Secure erase: A National Institute of Standards and Technology (NIST 800-88) accepted technique for properly purging hard drives. This method is supported by almost all modern SATA HDD. The PC-Link software is absolutely perfect for monitoring the work progress during operation in real-time. All relevant information for EVERY PORT is displayed on your PC screen, a powerful tool for sorting out lagging HDDs and keeping the operation as efficient as possible. 1. Monitor duplication status from PC while duplicators are connected to it. 2. Shows and records the brand name, model, S/N, duplication time, result of every HDD from all the ports, the info of both source HDD and target HDD are recorded. Records operation time, each port’s process details, including HDD’s model, capacity, S/N, result (pass, fail). Real-Time recording and viewing Log Report via PC-Link. Any falsification can be detected to ensure the report is genuine. You do not need to worry anymore about whether a log report is genuine or not.